in your daily time with God. 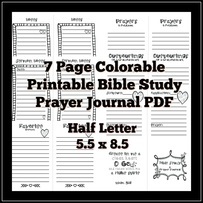 Places for prayer lists, answered prayers, sermon notes, praises, favorite verses, notes and observations, handy books of the bible page and it also features the S.O.A.P. method for bible study. Prints out on 81/2 x 11 standard pages. You will download a 9 page PDF file right after purchase of full resolution pages to print out as many copies as you need. 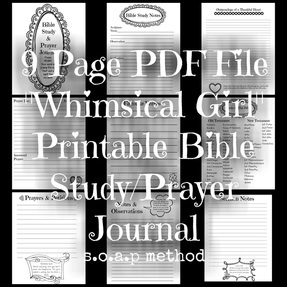 Download this whimsical bible study prayer journal to instantly print out and use in your daily time with God. 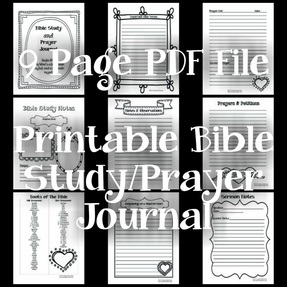 Download this half sheet study prayer journal to instantly print out and use in your daily time with God. Places for prayer lists, answered prayers, sermon notes, praises, favorite verses, notes and observations, and it also features the S.O.A.P. 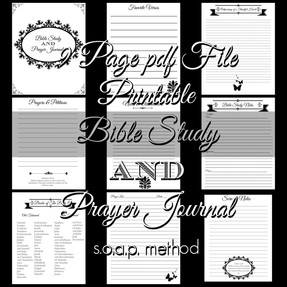 method for bible study. Prints out on 81/2 x 11 standard pages. You will download a 7 page PDF file right after purchase of full resolution pages to print out as many copies as you need.